Japan head into their seventh Rugby World Cup confident they can improve on their record of just one win and a draw from 20 games. "Our preparations have gone well," said head coach John Kirwan the day before announcing his 30-man squad. "We won the HSBC Asian Five Nations and the IRB Pacific Nations Cup, were competitive against Italy and played badly but still won [against the United States]." Japan is pooled with France, New Zealand, Tonga and Canada and Kirwan, who won a winner's medal with New Zealand in 1987, has targeted two wins - against the two other Tier Two nations. But he knows his side will also be judged on how they get on in their opening two games - "the easy ones" as he called them. "It's important that we are competitive in our first two games to show the world how much Japanese rugby has improved, and then win the last two. But to do that we must improve." Takeshi Kikutani will lead the Brave Blossoms four years after being dropped by Kirwan weeks ahead of RWC 2007. The Toyota Verblitz flanker is part of an athletic, skilful back-row that is very much at the heart of the "Japanese style" that helped Kirwan's team to their two pieces of silverware earlier in the season. "Kiku has really grown into the role of captain," Kirwan said. "It's difficult sometimes to wear the captain's armband but he's doing it well. It's important that he plays his game and then lets the leadership come." Kikutani leads a squad that contains 10 foreign born players but as Kirwan has pointed put a number of them have lived in Japan for a great many years. Michael Leitch, Ryu Koliniasi Holani and Sione Vatuvei all came to Japan at the age of 15 to study at high school, while Luke Thompson, Shaun Webb and Ryan Nicholas all have Japanese citizenship. "I am getting pretty tired about the whole foreigner issue," Kirwan said. "We are following IRB rules and right now we need to use the foreign players to make Japan better. They are all very proud to play for Japan and some of them have lived here a very long time. Rugby is a great game that embraces all races. We need the balance of getting success and the JRFU [Japan Rugby Football Union] moving forward to create a base to ensure we have better Japanese players coming through." One Japanese player Kirwan had been counting on, Ryohei Yamanaka, recently picked up a two-year ban after testing positive for steroid that the fly-half says was in a cream he used to help grow a moustache. Yamanaka's absence and an injury to Go Aruga sees Webb shift to fullback with Murray Williams in at flyhalf as backup to James Arlidge. Vatuvei was the only player to be named that didn't feature in the A5N and PNC campaigns and like Itaru Taniguchi offers Kirwan more options in the back-row. "We have a good hard running back-row and Sione adds to that," Kirwan said. 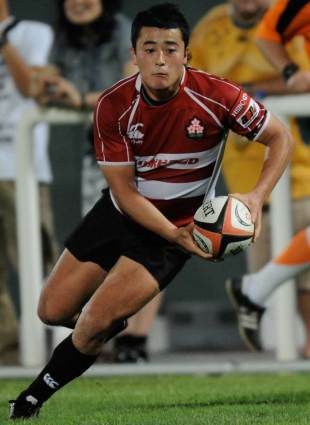 "He also offers up more line-out options, while Taniguchi can cover 8 and 6." Alisi Tupuailei and Taihei Ueda also offer versatility in the backs in a squad that sees a 16-14 split between forwards and backs. The two top teams in Japan - Panasonic (formerly Sanyo) Wild Knights and Suntory Sungoliath -both provide six players. "We are a much more complete team than four years ago," Kirwan said. "We are stronger, fitter, faster and understand our strengths and weaknesses better. "I am very happy with the side. We have spent the last four years putting the team together and everyone understands how we want to play. We have a good mixture of youth and experience. Hitoshi Ono and Hirotoki Onozawa (who will be appearing in his third World Cup) are the two oldest players at 33, while Leitch is the youngest at 22. While this year's target is two wins, Kirwan said he was still eying on the bigger picture. "I personally believe that we should be trying to knock on the door of the top eight this time, make the top eight in 2015 and try to make our own finals in 2019," he said. "Achieving our goals in this World Cup will show that we are doing the right things." Japan heads to New Zealand having beaten Tonga five times straight and having downed Canada twice since their epic 12-12 draw at the last World Cup. The Brave Blossoms have played France just twice, losing 30-18 in 1973 and 51-29 at the 2003 World Cup. Their only test with New Zealand came at the 1995 RWC where they lost 145-17. No wonder Kirwan said: "This is a well established team but they will need to prepare as it will be pretty intense over there."